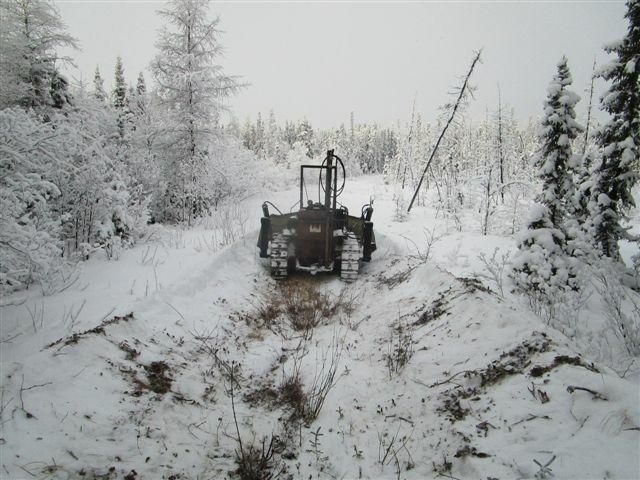 FOR THE LAST 20 YEARS I HAVE BEEN BUILDING A WINTER ROAD OR CAT TRAIN TRAIL BEHIND THE "KINGDOM" TO TEST MY EQUIPMENT AND HAVE FUN. 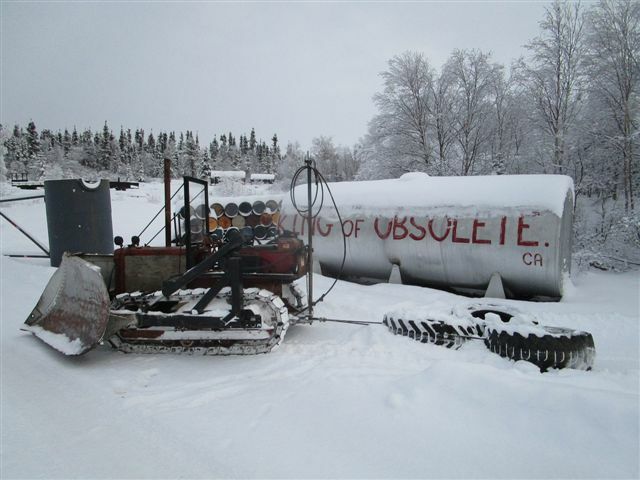 OVER THE YEARS I HAVE SEEN HOW THE WEATHER PLAYS A BIG PART IN THE SNOW CONDITIONS AND FREEZING OF THE GROUND. THE FALL OF 2015 WAS A VERY WET RAINY SEASON PLUS THE WEATHER WAS TOO WARM. ONCE THE SNOWS CAME THE GROUND WAS NOT FROZEN. 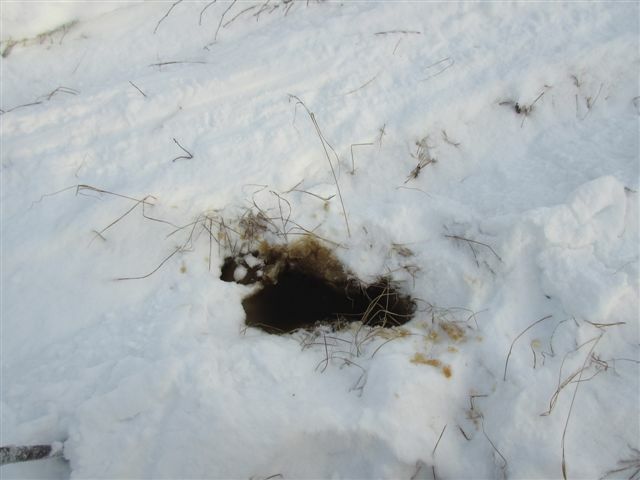 AS MORE AND MORE SNOW CAME WITHOUT OUT THE COLDER TEMPERATURES, THE SNOW ONLY ACTED LIKE AN INSULATING BLANKET TO KEEP THE HEAT IN THE GROUND. THE MONTH OF DECEMBER 2015 WAS A VERY WARM WITH SOME OF THE BIGGER LAKES NOT FREEZING OVER. THE SMALLER LAKES DID NOT HAVE ANY ICE FORMING THICKER THEN 3-4 INCHES AND THEN SNOW ON TOP OF THE ICE. 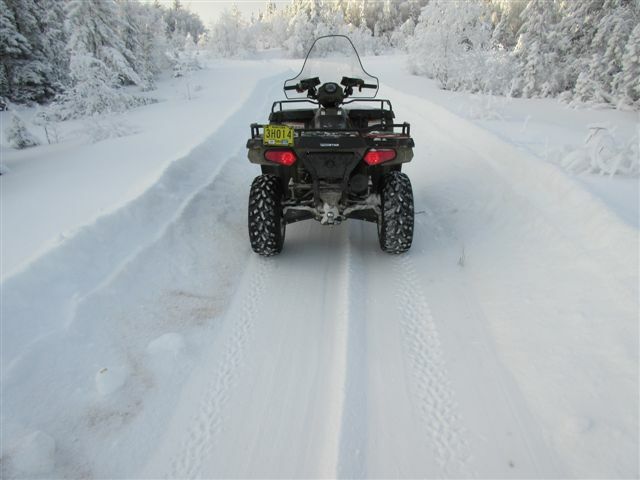 THIS COMBENATIONS MAKES FOR VERY BAD ICE WHICH IS NOT SAFE TO TRAVEL ON BY SKI-DOO OR VEHICLES. I WATCHED THE WEATHER AND KNOWING MY PAST EXPERIENCE WITH MY WINTER ROAD BEHIND THE KINGDOM. 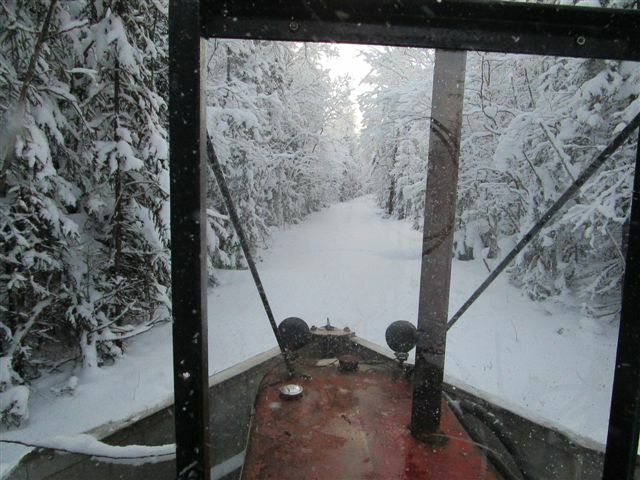 ON DECEMBER 23 2015 WITH A TEMPERATURE OF -23C , I HEAD OUT ON MY 1948 TD-6 CAT KNOWN AS "KOMMUNIST KAT" WITH THE 1929 LINN TRACTOR VEE PLOW FROM ISLAND FALLS HYDRO DAM PLUS DRAGGING A SET OF SMALL TIRES. I LEAVE THE KINGDOM DOING ENOUGH PLOWING SO THE CAT IS NOT GETTING STUCK AND THE TIRES ARE WORKING GOOD AS A DRAG TO GET RID OF THE SNOW. 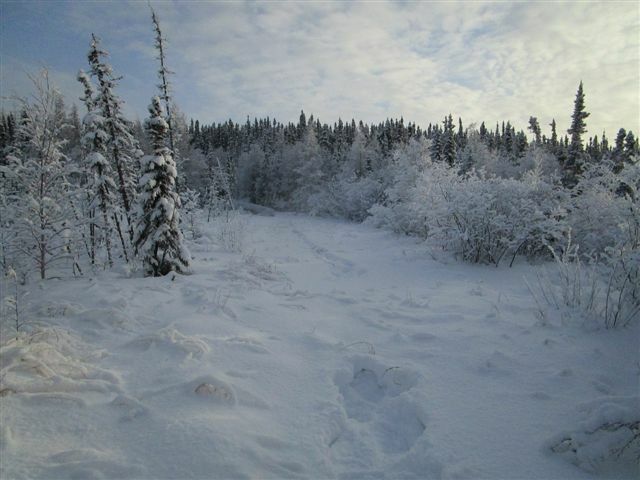 THE CAT TRAIN TRAIL -- WINTER ROAD HAS A LOT OF FROST ON THE TREES FROM ALL THE WARM DAYS WE HAVE BEEN HAVING IN THE GREAT WHITE NORTH. 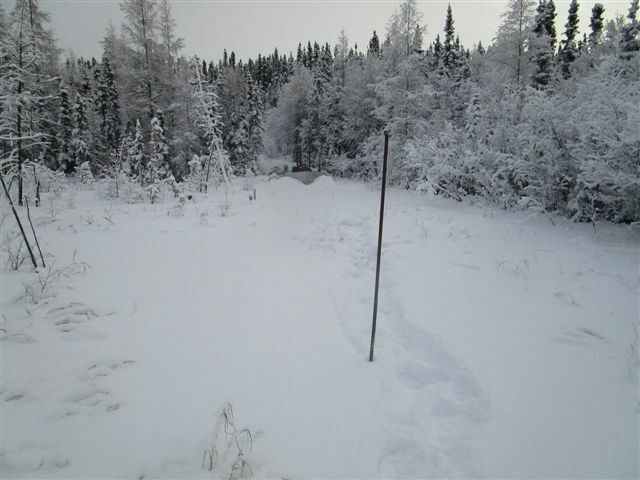 WHEN I ARRIVED AT THE MUSKEG -- SWAMP, I STOPPED THE CAT NEAR THE EDGE TO CHECK IF THIS SWAMP IS FROZEN. THERE ARE 3 SMALL STREAMS THAT FLOW THROUGH THIS SWAMP WHICH IS ONLY 200 FEET ACROSS. OVER THE YEARS I HAVE GOTTEN SMART AND LEFT THE TIRE DRAG UP ON HIGH GROUND INCASE THE CAT GOT IN TO TROUBLE. THE 14" OF SNOW IS NOTHING BUT SUGAR WHICH MAKES FOR GREAT FUN TO PLOW BECAUSE IT JUST FLOWS BACK IN BEHIND THE CAT. THEN I CHECKED TO SEE IF THE SWAMP IS FROZEN USING A 6' BAR. 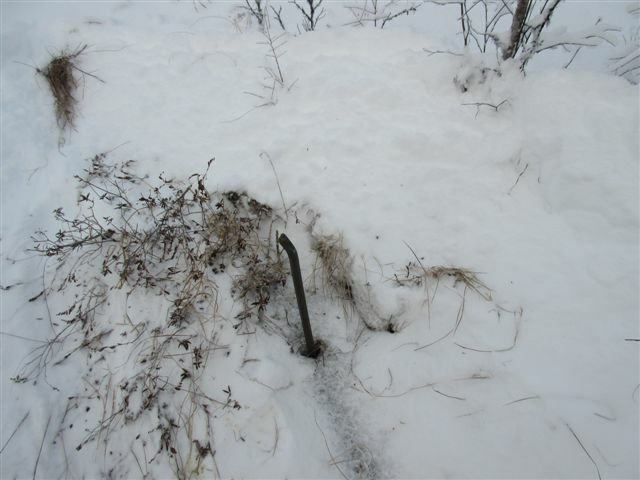 THE BAR JUST DROPPED THROUGH THE SNOW WITH NO RESISTANCE AND IN TO THE SWAMP. USUALLY IT TAKES 4 GOOD TAPS TO GET THE BAR TO BREAK THE FROZEN LAYER ON THE SWAMP BUT NOT THIS YEAR. A SHORT WALK OUT TO THE MIDDLE OF THE SWAMP WHERE THE WATER IS FLOWING UNDERNEATH THE SNOW AND IT IS NOT FROZEN. THIS SWAMP CAN BE GOOD GROUND THEN 4 FEET TO 6 FEET OF SWAMPY IN A MATTER OF ONLY A FEW FEET. 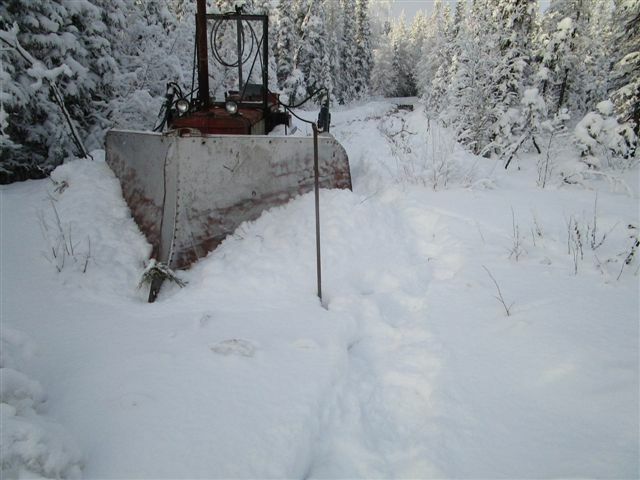 NOW THAT I KNOW THE GROUND IS NOT FROZEN I USE THE VEE PLOW ON THE KOMMUNIST KAT TO SEE HOW BADLY IT IS NOT FROZEN. 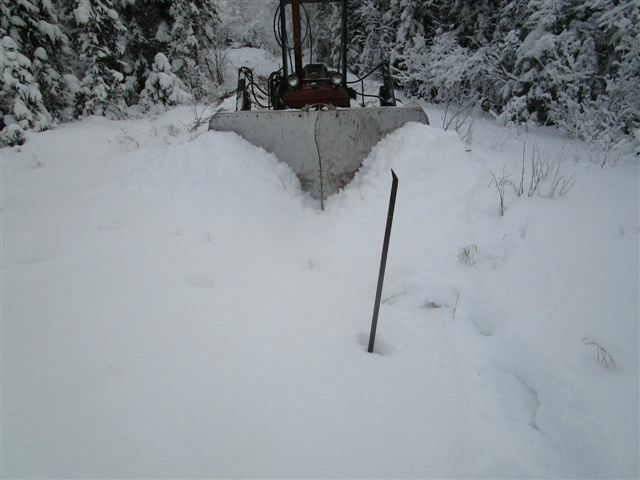 THE NON FROZEN GROUND CAN'T SUPPORT THE WEIGHT OF THE VEE PLOW AND WATER FLOWS UP UNDER THE SNOW. THIS IS THE WORSE I HAVE SEEN THIS SWAMP FOR NOT BEING FROZEN AT THIS TIME OF THE YEAR. NOW I TRAVEL AROUND TO THE OTHER SIDE OF THE SWAMP AREA BY USING THE OLD RAILBED. ONCE I GET AROUND TO THE OTHER SIDE I TRAVEL BACK DOWN THE TRAIL TO THE SWAMP. 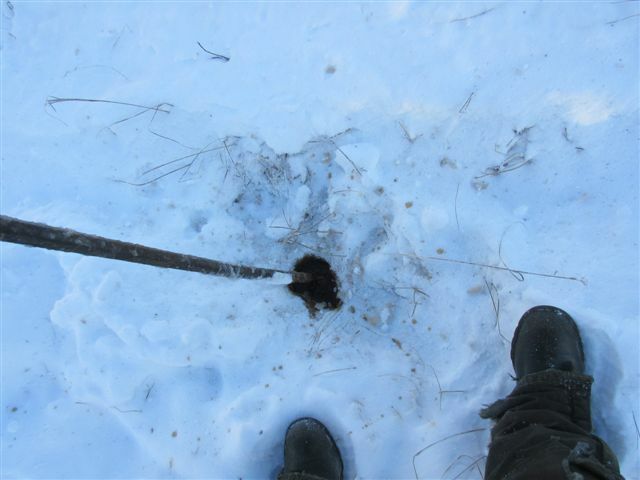 THE TIRE DRAG IS WORKING GOOD ON PUSHING THE SUGAR SNOW BACK OUT OF THE WAY AND LEAVING A SMOOTH SURFACE TO FREEZE. 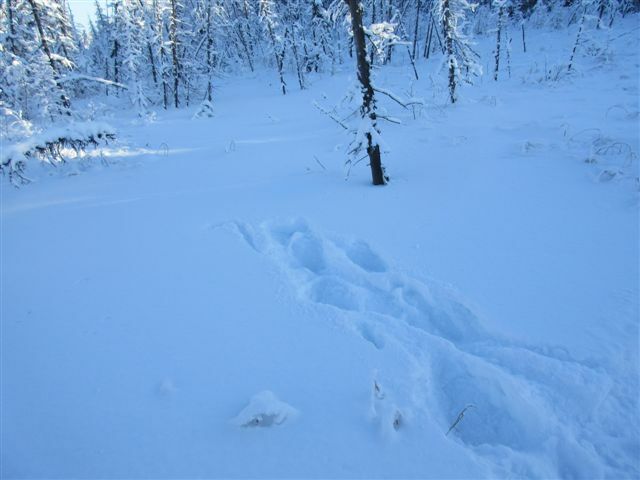 NOTHING IS FROZEN BECAUSE THE DEEP SNOW HAS INSULATED THE GROUND FROM FREEZING. 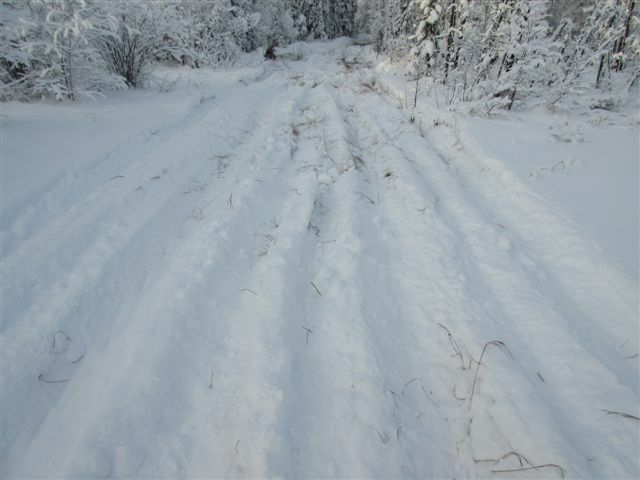 IF I USE A DRAG MADE FOR CUTTING AND LEVELING THEN I WOULD HAVE A DIRT ROAD WITH NO SNOW COVER. I LEAVE THE TIRE DRAG BACK OUT OF THE WAY AND TRAVEL OUT ON TO THE SWAMP. THEN GET OFF THE CAT AND CHECK THE SWAMP WHICH IS NOT FROZEN. I WALK OUT TO CHECK THE SWAMP AND NOTHING IS FROZEN. 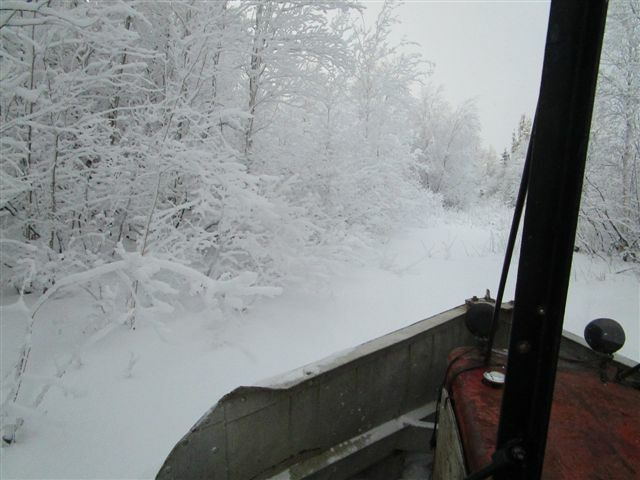 I WILL HAVE TO WAIT A DAY FOR THE SNOW TO FREEZE SO I CAN THEN GET BACK OUT ON THE SWAMP. 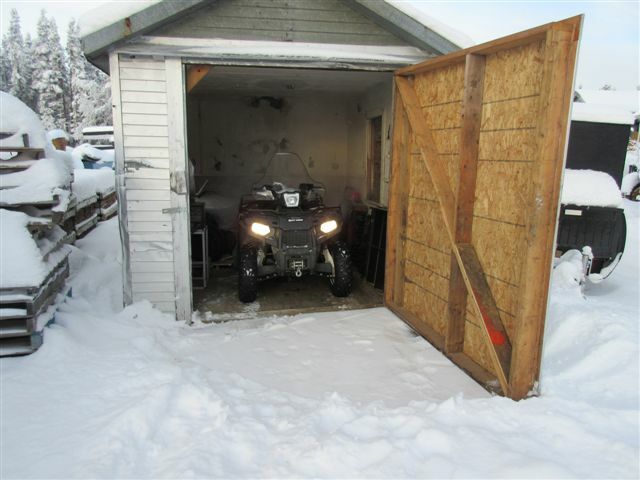 THE NEXT DAY ON DECEMBER 24 2015, IT WAS WARM ENOUGH THAT MY NEW QUAD STARTED AT -23C WHICH SURPRISED ME. 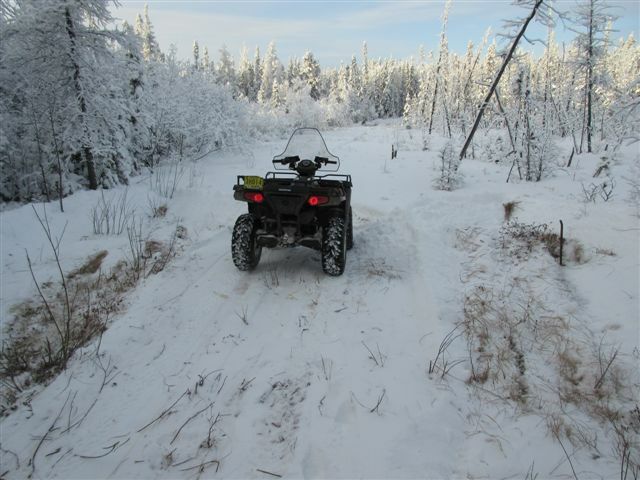 IT WAS VERY NICE THAT THE QUAD STARTED SO I DIDN'T HAVE TO WALK DOWN TO THE SWAMP - MUSKEG BEHIND THE "KINGDOM". THE SHORT DRIVE WHICH WAS JUST ENOUGH TO GET A CHILL BECAUSE THE QUAD IS NOT MADE FOR WINTER USE. I USED THE BAR TO CHECK TO SEE HOW MUCH OF THE SWAMP WAS FROZEN AFTER BEING BROKEN UP BY THE CAT 24 HOURS AGO. THE SAD PART IS THAT NOTHING REALLY FROZE AT -23C BECAUSE THE SWAMP IS STILL VERY WARM. USUALLY IN THE FALL WITH COLD TEMPERATURES THE WATER AND GROUND IN A SWAMP WILL COOL DOWN. BUT THIS YEAR WE DID NOT GET COLD DAYS OR NIGHTS SO THE SWAMP IS STILL VERY WARM. ONCE THE SNOW COVERS THE SWAMP IT WILL NEVER COOL DOWN WHERE THE TOP WILL FREEZE OVER NICELY. NOW I HAVE TO GET THE SNOW FLATTENED OUT FOR THE SWAMP TO FREEZE OR ATTEMPT TO FREEZE. I'M GLAD I LEASED 2 OF THESE QUADS SO I COULD HAVE A LITTLE FUN. I HAVE 4 YEARS TO PAY THE QUADS OFF AND NOW I'M GOING TO DRIVE ACROSS A NON FROZEN SWAMP. THIS IS OK BECAUSE THE MACHINE IF FULL INSURED AND HAS THE FULL WARRANTY PACKAGE TOO. 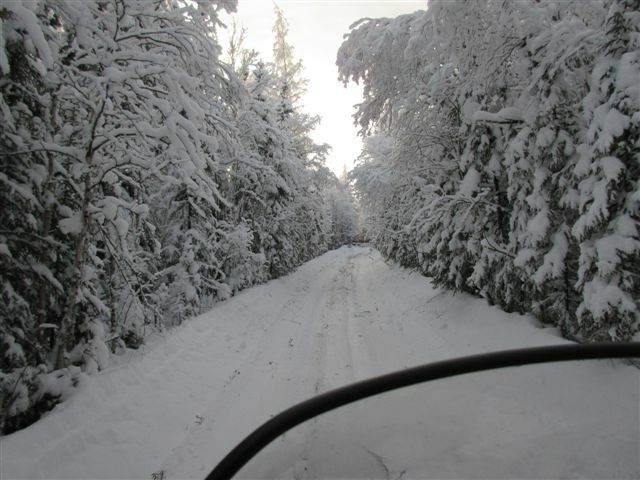 BUT DRIVING THE QUAD OUT ON TO A SWAMP THAT IS NOT FROZEN PLUS UP TO 6 FEET DEEP MIGHT VOID THE INSURANCE AND WARRANTY. OH WELL I BOUGHT THESE MACHINES AND I'M GOING TO USE THEM. IT IS NOT THE FIRST TIME OR THE LAST TIME I HAVE WALKED BACK TO THE "KINGDOM" WET FROM THE WAIST DOWN EITHER. 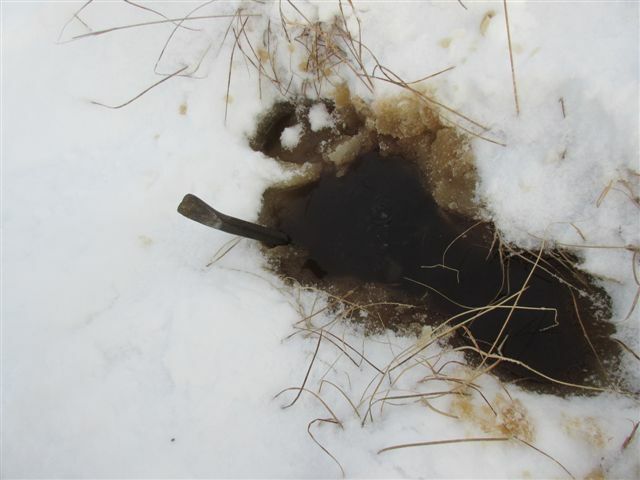 I HAD TO WALK VERY CAREFULLY BACK OUT ON THE SWAMP TO CHECK HOW MUCH THE QUAD BROKE UP THE NON FROZEN GROUND. THERE WAS ONE MAIN SPOT THAT I COULD WALK TO WITH OUT GETTING WET. A QUICK CHECK SHOWS THAT THE SWAMPY IS OVER 4 FEET DEEP IN THIS SPOT. IT WILL TAKE ABOUT AN HOUR OR MORE FOR THE OTHER WET SPOTS TO START FLOWING THROUGH THE SNOW ON THE SWAMP. I WAS VERY LUCKY NOT TO SINK MY NEW QUAD BUT THEN AGAIN I HAVE SUNK EVERYTHING I OWN IN THE SWAMP OVER THE YEARS AS A LEARNING EXPERIENCE. AS I HEAD BACK TO THE "KINGDOM" I STOP FOR A QUICK PHOTO OF HOW THE SUGAR SNOW HAS BECOME SOLID AND WILL SUPPORT THE WEIGHT OF THE QUAD. 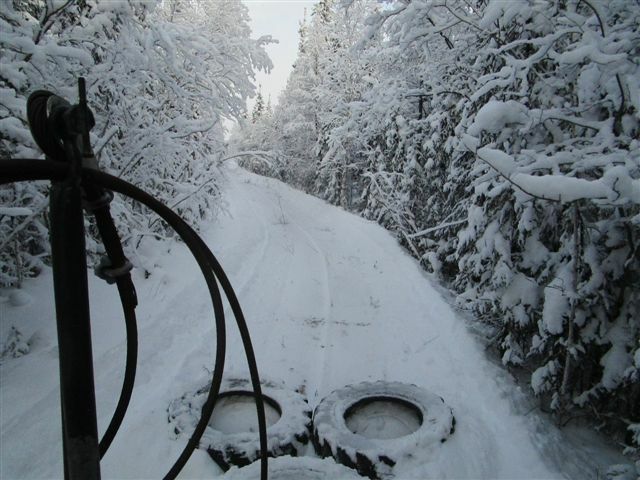 THE CAT TRAIN TRAIL -- WINTER ROAD IS SLOWLY COMING TOGETHER. OVER XMAS THE WEATHER TURNED REALLY COLD FOR 3 DAYS WHICH WAS GOOD FOR FREEZING THE SWAMP. 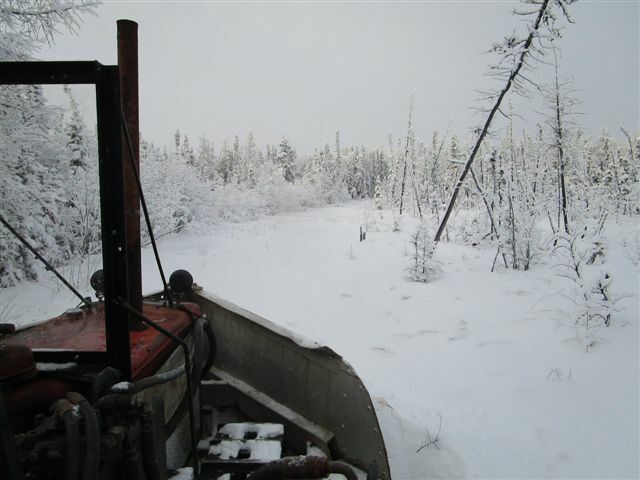 I WALKED DOWN TO THE SWAMP AT -32C BECAUSE I KNEW NOTHING WOULD START IF THE BLOCK HEATERS THAT WARM THE ENGINE WERE NOT PLUGGED IN. WHERE THE QUAD BROKE THROUGH THE SWAMP 2 DAYS BEFORE ONLY HAD 3-4 OF ICE WHICH IS NOT GOOD. 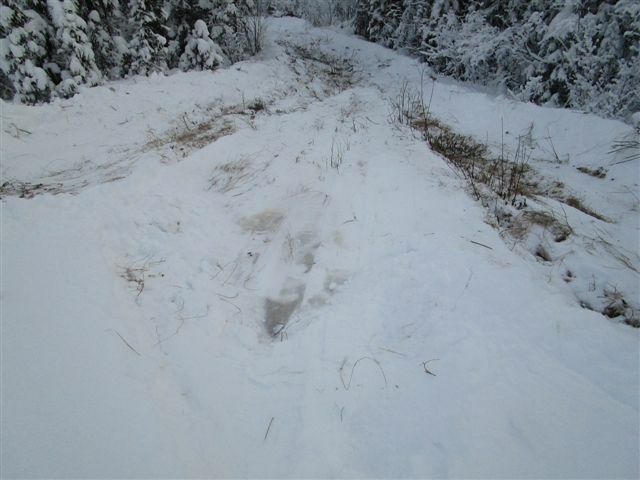 THE SWAMP IS STILL TOO WARM TO MAKE A GOOD WINTER ROAD TO SUPPORT THE WEIGHT OF HEAVY EQUIPMENT. I WALKED OUT ON TO THE SWAMP THAT STILL HAS SUGAR SNOW COVERING IT AND IT ONLY HAD A THIN CRUST OF ICE. I STILL CAN NOT DRIVE ANYTHING INCLUDING THE QUAD ACROSS THIS WITHOUT GETTING WET. 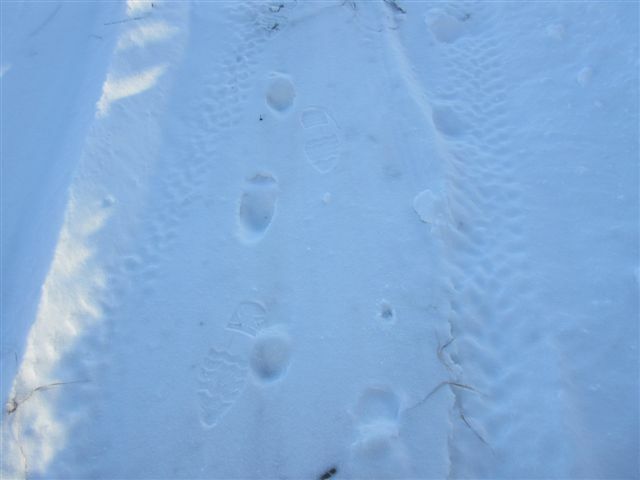 ON MY WALK BACK TO THE "KINGDOM" I SNAPPED A PICTURE OF FOOT PRINTS IN SUGAR SNOW AND FOOT PRINT ON TOP OF THE HARDEN SUGAR SNOW. WORKING THE SNOW WITH EQUIPMENT GETS THE SNOW TO FIRM UP TO SUPPORT HEAVY EQUIPMENT.